This week I played the Sunday afternoon slate (including SNF). I played two rosters equally across ten total cash games; six 3-man contests and four double up contests — which is the strategy I have used the past few weeks (will change for next week). I also dropped some entries into a quarter tournament and played a bunch of free rolls. Below are the two lineups that I played for the week in cash. Both rosters scored about the same — biggest miss being Allen Robinson in a good matchup against Oakland. I won 10% of my cash contests and this was overall a poor week. 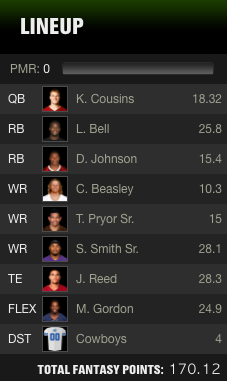 This week I went 1-1 in my keeper and dynasty leagues. This week, I scored 133 points and had a second straight loss. 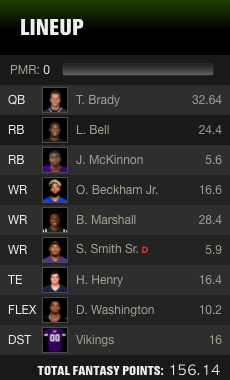 Ultimately, it was the collective 8 points from my two WRs that harmed me this week. I was on the fence to start Jamison Crowder this week — with Jordon Reed out and facing a good matchup against Detroit — but held onto Allen Robinson with an equally favorable matchup against Oakland. Allen Robinson continues to be plagued by the poor play of Blake Bortles — whose “targets” are either overthrown, under thrown, or picked off. The five quarters of SEA/ARI did not help either, going against Doug Baldwin and David Johnson. I was in this game until the last play was run on Monday night — needing only 1 more Denver point to knock the Houston defense down another four points. The three teams ahead of me all won (including my opponent who was in second place) but I remain in fourth place with a 4-3 record. At 135 points — I scored the second highest points for the week. My team generally performed well, but this win is attributed to my last second (literally — just before 1:00 pm) switch at QB. I ran with Kirk Cousins in a favorable matchup against Detroit, versus Derek Carr against Jacksonville. Reason for the last minute fade was ESPN’s Mike Clay’s wide receiver matchup column. 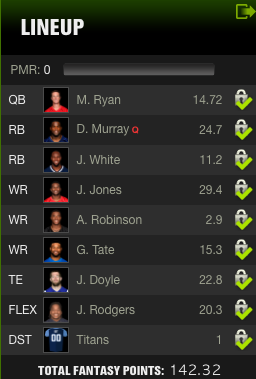 He was down on the Oakland WRs due to an unfavorable matchup so I made the change. Cousins scored enough points over Carr to give me the win. This win puts me at a 6-1 record and I maintain sole ownership of first place. This week I played the Sunday afternoon slate (including SNF). I played two rosters equally across ten total cash games; six 3-man contests and four double up contests — which is the strategy I have used the past few weeks. I also dropped four entries into a quarter tournament and played a bunch of free rolls. Below are the two lineups that I played for the week in cash. Big disparity between the two — as one focused on Drew Brees at home after the bye and the other — did not. As I mentioned in this week’s wrap up for my season-long leagues, I was high on the KC passing game (also off a bye) against a soft Oakland secondary. KC took care of business but more on the ground than the air. This week I did hold off on making major changes on Sunday — and stuck with the rosters I set earlier in the week. I won 50% of my cash contests — generally splitting between the two lineups. I also cashed one of the quarter tournament entries at a 4x return, ultimately breaking even. I am still considering moving to a single cash lineup going forward — although I cannot argue with how it has helped hedge larger losses. If I had used that strategy this week — it likely would have been the losing roster that was played. This week, I scored 109 points and notched my second loss of the season. It was one of those weeks — where it did not matter who I started — I was not going to win the matchup. 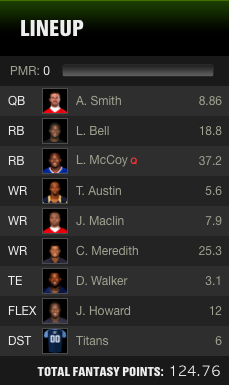 Biggest miss for the week was starting Jeremy Maclin over Spencer Ware. I expected Ware to maintain a role even with Jamaal Charles being touted as healthy — but not the majority of the carries. KC ran the ball this game passing far less than expected against a soft Oakland secondary. Good news is the other teams ahead of me also lost — however — another team snuck ahead of me with the same record and more points. I am now in a 5-way tie for first place with a 4-2 record (4th place by points). At 124 points — I scored the third highest points for the week (off of second by a fractional point). Biggest wins for me this week was picking James White off waivers to replace an anemic Jeremy Hill, and sticking with the red-hot Hunter Henry in SD even though Antonio Gates had returned. I really liked James White for the rest of the season now that Tom Brady is back in at QB. There is no time table for Dion Lewis’ return and he could potentially be one of those key waiver wire pickups. This win puts me at a 5-1 record and I maintain sole ownership of first place. This week I played the Sunday afternoon slate (including SNF). 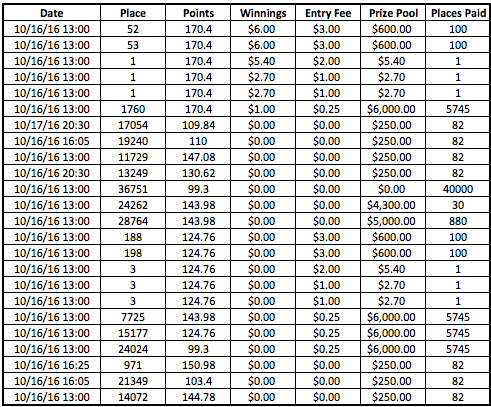 This was another good showing and I started to increase my contests again. I played two rosters equally across ten total cash games; six 3-man contests and four double up contests. I also dropped an entry into a free-roll tournament. Below are the two lineups that I played for the week. The biggest miss for me this week was the second lineup — on Sunday I swapped Brian Hoyer and Jordan Howard for Derek Carr and Jerrick McKinnon. The rationale was solid — pair the Vikings defense with their RB — but McKinnon lost plenty of touches to Matt Asiata. Again, I need to limit Sunday roster changes to injured and inactive players only. I won 60% of my contests — including all four of my double-ups which led to a 47% profitability on my entries. Although the two-lineup strategy has generally worked so far, I am considering moving to a single cash lineup going forward as the higher scoring lineup tends to be the first one I set. This week, I scored 171 points and picked up a much needed win after my first loss last week. I scored in the middle-of-the-pack as far as points go, but had the chance to score more. I picked up Sammy Coates after waivers cleared last week to be a bye-week filler — and flipped back and forth between him and DeVante Parker. The former would have earned me another 30 points — crucial considering I am in a 3-way tie for first place with a 4-1 record (but lowest in points). This win has lifted me one spot to third place. At 98 points — I scored the third fewest points for the week. I had several key players on bye — coupled with weak performances from fill-in players — led to me losing my first match of the season. Even if I had played my optimal matchup, I only would have added another 4 points to my total. I am still in first place based on points. This week I played the Sunday afternoon slate (including SNF, excluding the England game). After two poor weeks, I dialed down my contests a bit to see if this was a trend. I played two rosters equally across eight total cash games; six 3-man contests and two double up contests. Results this week were vastly improved — as I generally followed my instincts. I did make two adjustments courtesy of John Proctor at RosterCoach — adding Melvin Gordon to both lineups, and Steve Smith to one. 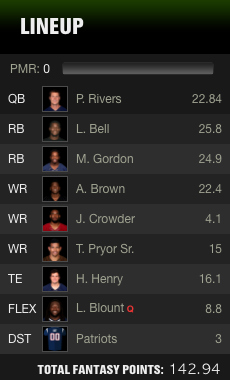 I also dropped four entries into a cheap tournament — two of which included my cash lineups. I ended up winning all eight of my cash games, and placing three of the four entries in the cheap tournament. Overall, a very successful week. This week, I scored 143 points and notched my first loss in my Keeper League. This one was particularly tough as it was against the owner that snaked Zeke Elliott in the draft. During the late games on the Sunday slate — Melvin Gordon fumbled while running down the clock — which led to a quick Drew Brees TD. It was an 8-point shift at which point I felt the week was sunk. Given that I lost by less than six points — that could have been the difference maker. On the bright side, I made the correct call to start Jeremy Maclin in the flex spot. This loss has dropped me from first to fourth (based on points). At 136 points — I scored the third most points for the week (twice in a row). 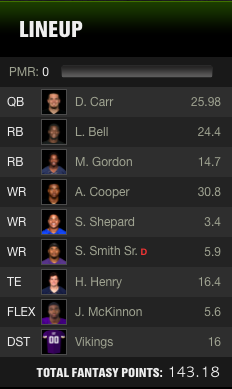 I faded Charles Sims for a favorable matchup by Jeremy Hill, and the decision worked out (despite the low point total). I remain the only undefeated team in this league.